Dark and eerie, Serena is an interesting yet imperfect experience aimed at fans of classic piont-and-click adventures. Like watching the sun set through a grime coated window, Serena takes players on a brief journey into the mind of a man whose thoughts grow increasingly dark as he pieces together the memories of a shattered marriage. Something terrible has happened but the specifics of what exactly has occurred seem to always be just out of reach as the man struggles to remember the time he spent with his wife Serena in a now lonely cabin. Though some horrific events are certainly depicted in the story, Serena is a point-and-click adventure that strives for a sense of dread and foreboding rather than the scares and gore typically associated with horror. It succeeds fairly well in its goal to tell a dark and depressing tale, but its limited interactivity and uneven storytelling may leave the overall experience of Serena unfulfilling for some. Though classified as an adventure game, Serena actually feels more like a visual novel in the sense that there is very little in terms of true gameplay. There are no puzzles to solve and there are no choices to make. 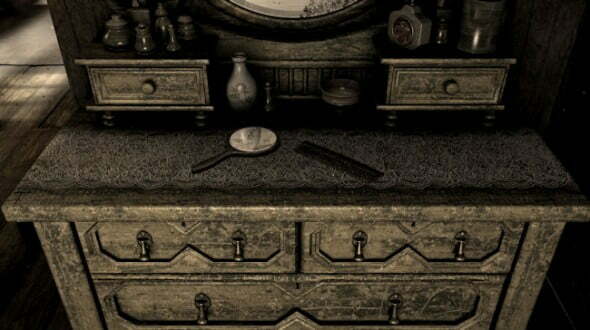 The player experiences the story simply by clicking on as many objects as possible and listening to the narrator as he comments on the memories that the items trigger in his mind. Each item may be viewed multiple times to reveal more dialogue and deeper memories, which is to say that you will be clicking on the same items over and over if you want to get the full story. The items on and inside this dresser will spark many memories. It’s not required that you click on everything in the room though. There are certain objects that will uncover memories that serve as plot points that move the game along. The discovery of a plot point is punctuated by a dramatic music cue and a noticeable change in tone from the narrator. As you make another pass around the cabin all of the objects will elicit new memories that reflect the narrator’s darkening frame of mind. Finding the next trigger object causes the mood and memories to change again in a process that repeats until the final act. The act of clicking on the same things repeatedly can become tiresome, but it’s necessary if you want to understand all of the nuances of the story. Unfortunately the story itself is fairly predictable and not entirely original. 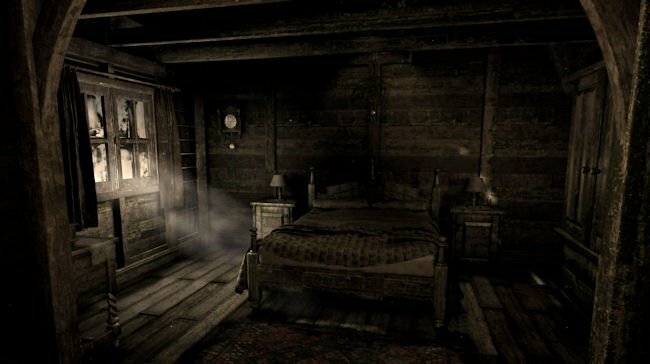 Before you even finish your first trip around the cabin you will probably have a pretty good idea of what to expect for the rest of the game. In a way this can work to build a sense of dread since you know, or can correctly assume, what unpleasantness is going to be revealed. However, there is a difference between dramatic irony and simply putting things together before the main character. You may be tempted to skip right to the end once you figure things out, but you still have to find the correct objects in the correct order before you can move on. Unfortunately, this makes the game seem longer than it needs to be even with its short run-time of less than an hour. The manner of progressing the plot by clicking on certain objects is also a contributing factor to the uneven storytelling of Serena. At first the narrator recalls pleasant times spent with his wife, but his mood changes abruptly upon the discovery of the first plot point. It’s a rather jarring transition that repeats every time the plot progresses. The narrator experiences happiness, anger, fear, and other emotions in very noticeable chunks. Rather than a creeping, steady decline into the darker emotions, it feels more like being pushed off of a series of emotional cliffs before reaching the bottom. All that said, the story, though predictable, isn’t bad. Without spoiling anything, there are some minor twists that make you want to keep going. If you take the time to search the cabin thoroughly you will discover more about the main character and why things went so terribly wrong with his marriage. It is all presented from his point of view of course, but a little inference goes a long way in helping to decipher what is really going on. The end result is a depressing tale that will satisfy those looking for a quick, dark experience. The overall atmosphere of Serena enhances the intended experience well. The cabin and all of its contents look timeworn and dreary, lit by the light of a setting sun that gives everything an almost monochrome color. These visuals play well into the story’s themes of time lost and a disintegrating relationship. The cabin’s deteriorated appearance reflects the theme of the story. There is also a feeling of claustrophobia that permeates the game caused not only by the tight confines of the small cabin, but by the restricted way in which the narrator moves around. In a throwback to adventure games of times past, the game is played in a first-person perspective and all character movement is done by clicking on the correct portion of the screen rather than by being able to move around freely in a 3D environment. Though this may feel unnecessarily limiting to some, it adds an intangible layer to the overall feeling of the game. Those that dig around will notice references to older adventure games and it seems that these games were strong influences on how the developers wanted their game to feel. In keeping with the nostalgic feel and limited movement, there is very little in the way of actual animation within the game. Almost none of the objects in the cabin can be moved. Looking closer at something or opening a drawer is accomplished by fading from a wide view to a static image of a closer view. The transitions aren’t distracting, but they are worth noting because they reinforce the old-school feel of the game. The lack of movement adds an eerie stillness to the environment and strengthens the effect when something does actually move on screen. Overall, Serena is a fine effort but not something that everyone will enjoy. It is not scary enough to satisfy horror game fans and the problems with the way the story is told will frustrate some of the more impatient gamers. However, fans of classic point-and-click adventure games should give Serena a try. At under an hour of total play time, adventure fans will find the time they spend unraveling the fate of Serena enjoyable, though, given the nature of the story, not terribly uplifting. Serena is free to play and available for download on PC, Mac, and Linux via Steam. A burgeoning writer with aspirations of grandeur, Chris is an avid gamer with a particular fondness for the history of the video game industry. When he's not playing games, Chris can be found watching movies, collecting comic books, watching pro-wrestling, and attempting to share his opinions on these topics with anyone who will listen.